When it comes to food, my father’s mother and my mother’s father have been the most influential in my life. My grandmother taught me all about food and life, and my grandfather taught me all about life and food. My memory of my grandmother always revolves around Friday night suppers and roast chicken. I can remember the side board in her dining room being laden with roast potatoes, peas, gem squash and the lovely roast chicken we were going to eat for supper. My grandmother passed away when I was 12 and roast chicken dinners became a nostalgic reminder of my gran. My dad would let me carve the chicken and I remember as if it were yesterday, my sister and I alternating between who got the parsons nose, and who got the wishbone. To this day, a roast chicken dish reminds me of my dad and my grandmother. My clearest food memory of my grandfather is a dinner he held for his 80th birthday. He had some smart French chef cater the event and I was told in no uncertain terms that I had to try the béarnaise sauce with my meal. I didn’t know it at the time, but béarnaise sauce is my mom’s favourite. When I think of my mother and grandfather, I think of beautiful fillet steak with an unctuous béarnaise sauce to go with it. So, for this project I chose to make roast chicken quarters with a béarnaise sauce so that I could be transported right back to moments of bliss and happiness with my family who now live so far away from me. What is your nostalgic food memory? I absolutely love this post Tandy. Food and food stories are part of our culture and what makes us human. I love that these foods take you to relationships that were not just special but foundational to you becoming who you are. Thank you so much for the comment Tammy – memories of family are so important! Me too, and it grows so well! This sauce looks great, would love to try it for a upcoming dinner. I love the connections of food and memories. So special and lovely that you can think of them them again and again. Happy days. I haven’t made that for ages! It is now back in the rotation 🙂 Thanks for the reminder and your recipe. 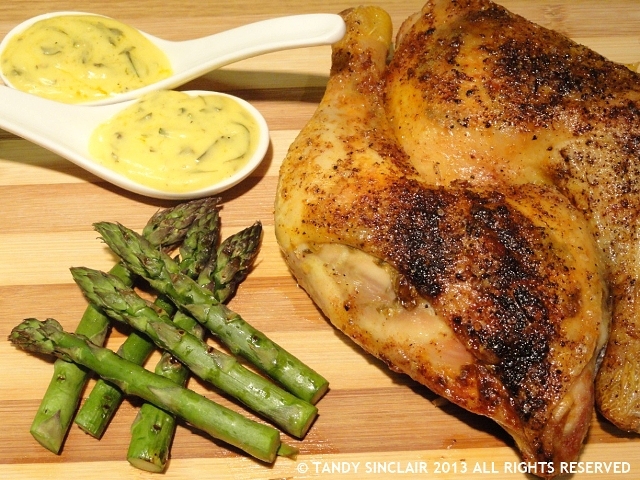 Wow, your bernaise sauce looks so smooth Tandy!…. I love Béarnaise sauce. Thanks for sharing your recipe Tandy! Your sauce recipe sounds great! Lovely memories and Bernaise recipe Tandy. Bearnaise is such a classic for a reason! So rich and delicious. I hope you try this – don’t worry about which vinegar you use!